The quality of model-based decision-making support strongly depends on the data, its completeness, fullness, validity, consistency, and timely availability. These requirements on data are of a special importance in supply chain (SC) risk management for predicting disruptions and reacting to them. Digital technology, Industry 4.0, Blockchain, and real-time data analytics have a potential to achieve a new quality in decision-making support when managing severe disruptions, resilience, and the Ripple effect. A combination of simulation, optimization, and data analytics constitutes a digital twin: a new data-driven vision of managing the disruption risks in SC. A digital SC twin is a model that can represent the network state for any given moment in time and allow for complete end-to-end SC visibility to improve resilience and test contingency plans. This chapter proposes an SC risk analytics framework and explains the concept of digital SC twins. It analyses perspectives and future transformations to be expected in transition toward cyber-physical SCs. It demonstrates a vision of how digital technologies and smart operations can help integrate resilience and lean thinking into a resileanness framework “Low-Certainty-Need” (LCN) SC. Ben-Daya, M., Hassini E., & Bahroun Z. (2018). Internet of things and supply chain management: A literature review. International Journal of Production Research, https://doi.org/10.1080/00207543.2017.1402140. Dubey, R., Gunasekaran, A., Childe, S. J., Wamba, S. F., Roubaud, D., & Foropon, C. (2019). Empirical investigation of data analytics capability and organizational flexibility as complements to supply chain resilience. International Journal of Production Research. https://doi.org/10.1080/00207543.2019.1582820. IBM. (2017). Retrieved November 20, 2017, from https://www-03.ibm.com/press/us/en/pressrelease/50816.wss. Ivanov, D. (2018c). Managing risks in supply chains with digital twins and simulation. Retrieved from https://www.anylogistix.com/resources/white-papers/managing-risks-in-supply-chains-with-digital-twins/. Ivanov, D., & Dolgui, A. (2019). 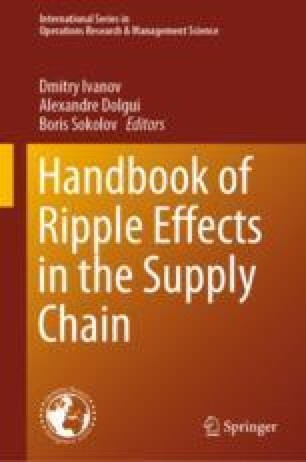 Low-Certainty-Need (LCN) supply chains: A new perspective in managing disruption risks and resilience. International Journal of Production Research. https://doi.org/10.1080/00207543.2018.1521025. Panetto, H., Iung, B., Ivanov, D., Weichhart, G., & Wang, X. (2019). Challenges for the cyber-physical manufacturing enterprises of the future. Annual Reviews in Control. https://doi.org/10.1016/j.arcontrol.2019.02.002. Priore, P., Ponte, B., Rosillo R. & de la Fuente, D. (2018). Applying machine learning to the dynamic selection of replenishment policies in fast-changing supply chain environments. International Journal of Production Research, https://doi.org/10.1080/00207543.2018.1552369.